LeBron James will have the support of Arnold Schwarzenegger when he steps out to make his Los Angeles Lakers debut on Thursday. Four-time NBA MVP James will turn out for the Lakers in a competitive game for the first time against the Portland Trail Blazers, as he looks to improve the fortunes of a team that have not won a championship since 2010. 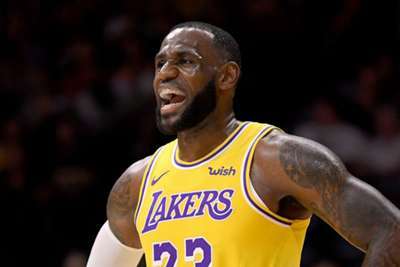 Terminator star Schwarzenegger, who is the former governor of California, certainly believes James can be the key man, sending the ex-Cleveland Cavaliers star a supportive message ahead of the Lakers' opener. "LeBron, you're the champion, you're the best, and you're the only one who can really make the Lakers great again," said Schwarzenegger, 71, pausing a gym workout to address James. "Go for it, do it. "I'm counting on you, because there is no magic pill. I'm going to watch you and the rest of the team every single time. Hasta la vista, baby."